You won’t believe what some leading conservatives had to say about criminal justice reform this week—because they were actually right. 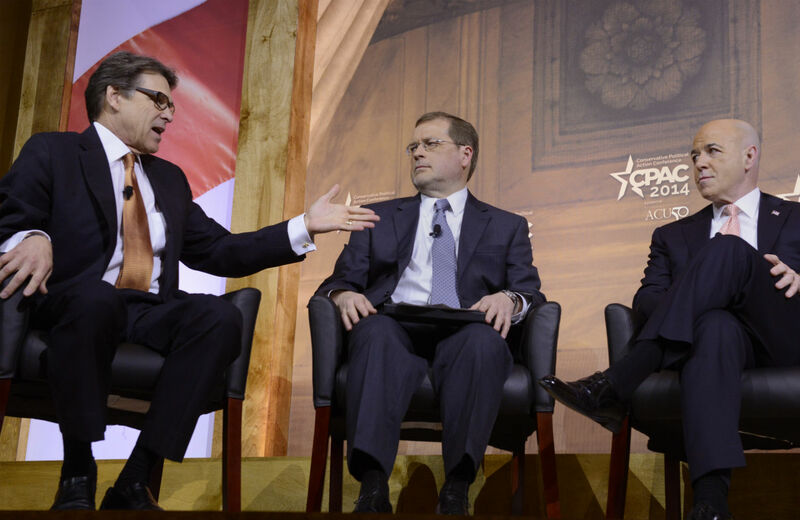 Rick Perry (L) makes a remark as Grover Norquist (C) and Bernard Kerik listen during a panel discussion on "Criminal Justice Reform" at CPAC (Reuters/Mike Theiler). Then there was former New York City Police Chief Bernie Kerik, who no doubt has a unique view on the criminal justice system: aside from being police chief and running Rikers Island, he also was incarcerated for three years on conspiracy and tax fraud charges. “If somebody told me I would go to prison and meet some really good people, I would have laughed in their face. The reality is, I met some really good men. Decent men. Good fathers, good family men,” Kerik said. “We’ve got to create alternatives, and we have to stop putting people in prison that don’t necessarily have to be there to learn their mistake,” he continued. Given that it was of course a political conference, the anti-tax crusader and guardian of the Republican brand Grover Norquist was there to provide the political calculus behind passing real prison reform. His theory was straightforward: as a matter of political necessity, the effort had to be lead by conservatives. Norquist struggled to explain exactly why this was. He said conservatives had the right federalist approach by starting the reform movement in the states, but naturally state penal systems have to be reformed at that level, while the federal criminal code must be addressed by Congress. But, at heart, Norquist isn’t wrong on the strategy. Buy-in from the left and right is surely needed to enact real reform, and the CPAC panel reflected ongoing, noteworthy momentum on that front. Republicans aren’t just declining to criticize Democratic efforts at reform but trying to out-muscle them and claim the issue. There were, of course, huge blind spots during the discussion. The all-white panel literally never mentioned racial disparities in sentencing—one of the most glaring injustices in America’s criminal justice system. The only glancing mention of race at all came when Kerik noted that “black kids with felony convictions” have a hard time re-entering society. Rather, the unfairness of the criminal justice system was presented in a way that dovetailed with the more typical CPAC jeremiads. Nolan also suggested federal prosecutors had it in for conservatives (and perhaps white college athletes). “Think of the resources wasted on witch hunts against Dinesh D’Souza, Scooter Libby, the Duke Lacrosse team and Senator Ted Stevens,” he bemoaned. Though the high number of nonviolent drug offenders was mentioned over and over again, nobody ever revealed that blacks make of 50 percent of state and local prisoners incarcerated for drug crimes, nor that black kids are ten times more likely than white kids to be picked up for drug offenses despite being less likely to use drugs. The drug war couldn’t possibly be conceived as racially motivated—instead, the panelists had to cook up some extremely unusual reasons for why so many people were in jail for possessing trivial amounts of drugs. “For the bureaucrats, it’s easier to pick on these first-time offenders that are small cogs in the chain. Taking on a big kingpin means your family and you are threated by it, and unfortunately a lot of bureaucrats are afraid. And so they go after the numbers of small people,” said Nolan. The reforms pushed by the panel were limited in other ways, too. There was no small irony in having Rick Perry talk about criminal justice reform, since he has presided over more executions than any other figure in American history, including at the execution of at least one likely innocent man. Naturally, the death penalty never came up. That’s how he closed his remarks—well, right before launching into a non-sequitur about the Keystone XL pipeline and unfair federal taxes, almost as if he had to close on a note that reassured the audience he was still one of them. Moments later, everything was back to normal. Ralph Reed was onstage noting gravely that “there is, in truth, a war on religion and a war on religious values being waged by this administration and their radical allies.” Then he went on to compare Obama to George Wallace.